It’s always nice traveling to exotic locations to simulate my imagination but working on familiar ground that is close to home can do the same thing if you take the time to really look at what is around you. The genesis for it was the near daily walks my daughter and I have been going on at the Atlanta Botanical Garden for the past couple of weeks. She’s back in school but I am still going because the small day-to-day changes in the plants have caught my attention. She was the one who made me really aware of the shape, color and form of the Lotus seedpods and I wanted to make a photo of one as a thank you gift for her. I shot with a Nikon D810 and AF-S 24-70mm f/2.8G lens in hazy mid-morning sunlight. The camera was tripod mounted using an old Gitzo 1341 aluminum leg set with a late model Arca-Swiss B1 Monoball, one with a removable quick release clamp. 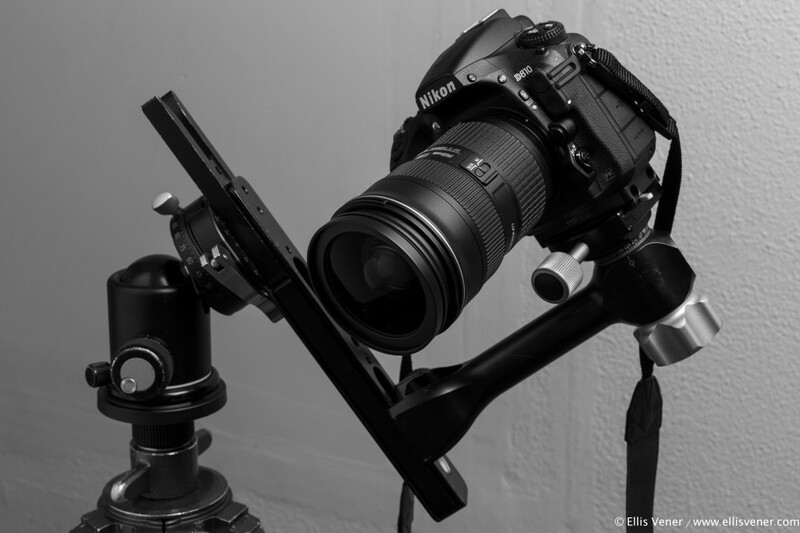 I recently replaced the Really Right Stuff PCL-1 panning clamp I had been using since at least 2006 with the new PC-LR panning clamp which has proved to be a big improvement. To get the camera exactly where I wanted it I also used a CB-10 camera bar and PG-02 VA. With the head tilted over the PG-02 VA let me get the camera exactly where I wanted it in relation to the flower. The camera was set up for Live View, Aperture priority exposure mode, and single point AFS-C focus mode. To make sure I was getting the sharpest image possible I used the camera’s self timer so I wouldn’t jiggle the camera and also set it to use the new “Electronic First Curtain” mode. This new feature of the D810 eliminates the possibility of any “mirror bounce” effect by removing the need for the camera to first close the mechanical shutter and then reopen it for the actual exposure when shooting in Live View Mode. It’s very handy for both close-up work and time exposures. The best frame turned out to be the second to last of the thirteen frames I shot. After deciding on this photo I thought it might look better cropped and as a black and white image so after making a virtual copy, cropping, and experimenting with Lightroom’s built-in Black and White filter set, I settled on a square crop and the Yellow filter. After that I tweaked the Exposure (-20), Black Clipping (-33), and Clarity (-13) settings and exported the image as a 16-bit per channel Pro Photo RGB TIFF to finish the Development Process in Photoshop CC (2014). In Photoshop CC, I did some minor spotting of a few tiny stains on the petals using the Spot Healing Brush tool and added a Levels Adjustment layer in which I used the black eyedropper on the shadowed area to set it to maximum black and anchor the image. The final step was to use the PhotoKit Sharpener’s (a plug-in available from pixelgenius.com) Creative Sharpener “Sharpen Narrow Edges 2” effect. This is one of those rare images that truly is very strong as a color but also as a black and white photograph. I find both versions to be very appealing. The black and white version has a real delicacy to it while the color version is more earthy, sensuous and exotic. Copyright ©2014 Ellis Vener. All rights Reserved. Ellis… I believe this is a lotus, not a water lily. All that expensive equipment/set-up overkill/PP for a mediocre image that could have easily been captured by a cheap P&S…handheld. I don’t mean to be overly harsh, maybe I am missing something? Achieving simplicity is always harder than it looks. Sorry you don’t like the photo, Nigel. I went back and forth on that. They are part of the same family and both are planted in the same pond. I really like the detail you were able to achieve, especially with one image. 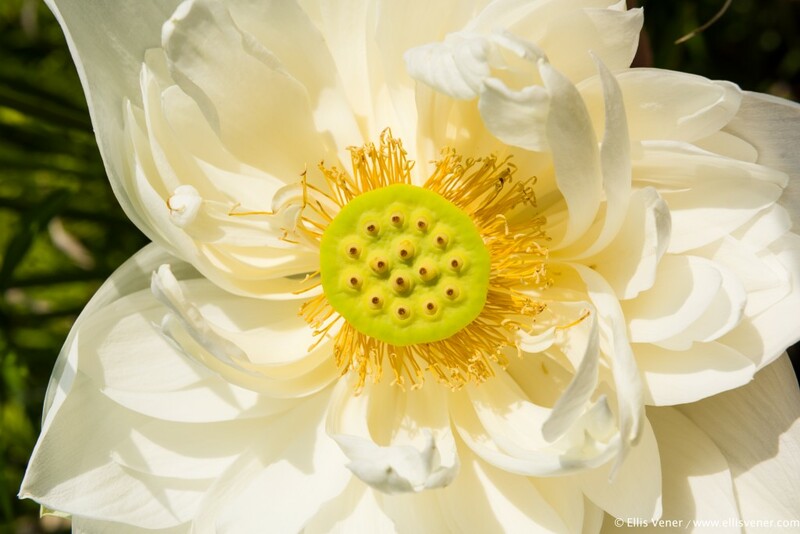 Type of flower, “complex vs. simple”… ultimately photography is about artistry and continually learning to capture more of what we are able to appreciate with our eyes – and share with others with similar purpose, or not. I would invite the critic to submit his work and see if all share his vision for beauty. Is not encouragement, not purposeless criticism, an important and large part of our community? Only thought I would wonder is what would/could be different with the RRS Macro Focusing Rail with image stacking. Keep up the good work. In an ideal situation, focus stacking would have worked great, but as the pond was out of doors and even without a breeze, the flower is at the end of a long stalk and sways too much to even think about trying that. Have to say I kind of agree with Nigel. Don’t really see what was so special about the shot or result that it needed to be written up, except as an obvious shill for the RRS equipment. Plus, shooting at f/13 = major diffraction. Why not an Nikkor 85mm PC lens instead? Whether you do or do not like this or any other photo is strictly a matter of personal taste. How did this photo got picked for Really Right Stuff’s blog? I sent a low res version of it out in a small email blast to a few people including Mr. Johnson here at Really Right Stuff. It was unsolicited. He liked it and asked Mark to contact me about using it their blog. Generally when one “shills” for a company like Really Right Stuff, Arca-Swiss, Gitzo, Adobe, Nikon, Canon, Elinchrom, Westcott, Profoto, Epson, etc., the person doing the shilling is usually compensated with either cash, or free gear, or both. RRS doesn’t and hasn’t ever compensated me in any manner. The RRS gear I use is equipment I own. I have bought it from them over the years at full retail price, much to my wife and accountant’s chagrin and a sizeable dent in my bank account. Why f/13? Because at the subject to camera distance that gave me the depth of focus I wanted. And if in real world situations you see a “major” and unacceptable loss of acutance between f/5.6 and f/13 you are likely photographing the small type on the labels on wine bottles, doing copy work, or you are an armchair photographer who spends too much time reading photography review sites. Am I saying diffraction is never an issue? No. But I make photos in the real world for real world clients who pay well and I test my gear rigorously enough that I know it’s limitations. All technical aspects of photography in the real world involve technical trade offs; try not to let that limit you. 1) For the same reason I didn’t use a 100mm Zeiss Makro or a PhaseOne IQ260 digital back on Sinar P3 with a Schneider APO Lens: I didn’t happen to have one handy. Using a longer lens at the distance I was restricted to working at would not have given the composition. and framing I desired, and a different foreground/background relationship. 2) Even if I had a Nikon 85mm PC-E neither the tilt or shift function would have been useful for this photo. I didn’t need to tilt the plane of focus, and changing the near/far perspective on the flower and seed pod spatial relationship by shifting the lens position, or using the shift movement to get a different composition would have been useful. If I were really being a shill for Really Right Stuff, I’d have written that i was also using one of their tripods instead ofa thirty- year old, discontinued Gitzo, the BH-55 head instead odf a discontinued Arca-Swiss B1 Monoball. Since I don’t own either of those RRS products (and have paid full price for the RRS gear I use) I’m hardly shilling. I laid out all of the technical information in my post for educational purposes. No one at Really Right Stuff solicited the photo, nor have I been compensated for their use of it. They first became aware of it from a mini e-mail promotional blast I sent out last week and asked if it could be used for their blog. To your technical concerns: As I am sure you know, every technical aspect of photography is the result of a balancing act. The aperture I used, ƒ/13, gave me the depth of focus I wanted. I did shoot at other apertures but this one produced the photographic effect I wanted. It sure would be nice to always work at any lens’ optimum aperture for every photo I make, and also with the Nikon D810 always set to ISO 64 – but the real world doesn’t always let me. Why didn’t I use Nikon’s 85mm PC-E lens? I didn’t have one with me and even If I had, for this photo it would have been the wrong focal focal length. I would have had to place the camera further back from the subject and that would have changed the foreground to background spatial relationships, and compelled me to to use a smaller aperture, compounding aperture related diffraction. Also neither the tilt or shift movements would have been useful for creating the photo tha tcame into my imagination when I first saw the photographic potential there. I harbor no illusions that other people, or perhaps myself on another day or even at a different time of day, might have seen other ways to photograph it, or maybe not even responded to it. First, thank you so much for allowing us to use your image and for taking considerable time to share the details of how you made the shot. I liked the image very much the first time I saw it and even more now. Second, thank you for your diplomatic and educational responses to comments. A lesser being may have taken offense. First, thank you Mr. Vener for sharing your knowledge and experience with us. Photography is a never ending learning experience and it is always interesting to see how others arrive at their end results. Second, there is no excuse for rudeness. The people who use their anonymity to make nasty and discrediting comments are small and insignificant. Sadly, with all the intriguing and powerful things that the internet has brought us it has also brought out the worst in many people. I would say, on a wall I’d go for the monochrome; in coffee table book I’d go for the color. Both are deliciously well done. I have just started to photograph about a year or two ago. I shoot in black and white and make my own prints in a darkroom. I am learning to see photographically, or as they say, to see what the subject can potentially be rather than simply as it is. 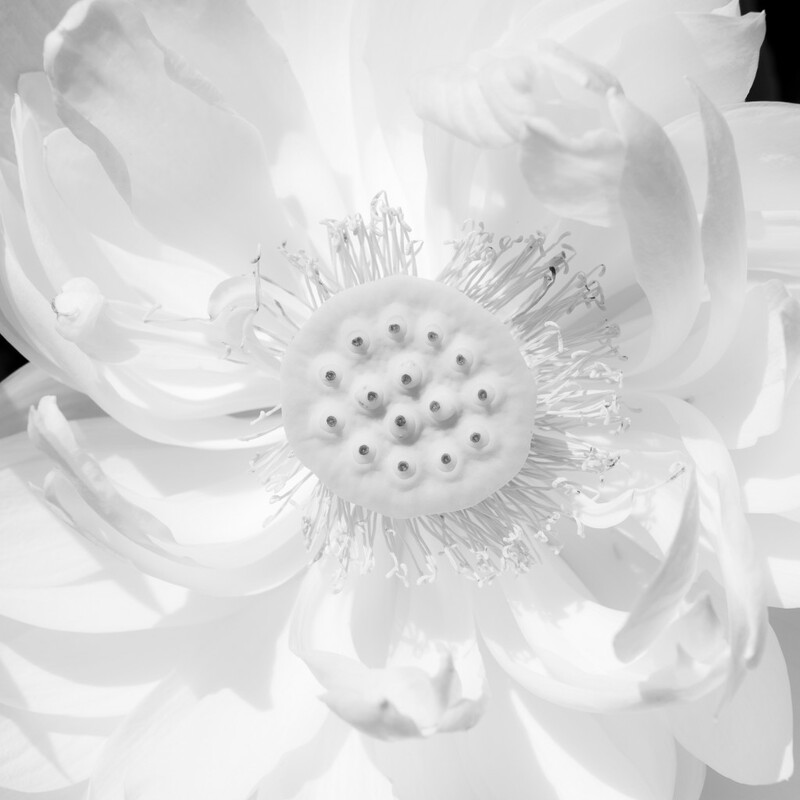 I clicked on your write-up because I was captivated by your photo of the lotus flower. We have plenty of them in Asia. It is often hardest to photograph the most familiar scenes and to show the subject in a different light. By the way, this is a lotus, not a lilly. I’m not a botanist, but I believe lotus leaves rest on the surface of the pond while lillies rise out the pond.